Google Home speakers enable users to speak voice commands to interact with services through Google's personal assistant software called Google Assistant. A large number of services, both in-house and third-party, are integrated, allowing users to listen to music, control playback of videos or photos, or receive news updates entirely by voice. Google Home devices also have integrated support for home automation, letting users control smart home appliances with their voice. Multiple Google Home devices can be placed in different rooms in a home for synchronized playback of music. An update in April 2017 brought multi-user support, allowing the device to distinguish between up to six people by voice. In May 2017, Google announced multiple updates to Google Home's functionality, including: free hands-free phone calling in the United States and Canada; proactive updates ahead of scheduled events; visual responses on mobile devices or Chromecast-enabled televisions; Bluetooth audio streaming; and the ability to add reminders and calendar appointments. The original Google Home has a cylindrical shape with colored status LEDs on the top for visual representation of its status. The cover over its base is modular, with different color options available through the Google Store for matching with home decor. In October 2017, Google announced two additions to the product lineup, the miniature puck-shaped Google Home Mini and the larger Google Home Max. In October 2018, the company released the Google Home Hub, a smart speaker with a touchscreen video display. In March 2016, reports were published about Google developing a wireless speaker to compete against the Amazon Echo. Google Home was officially announced at the company's developer conference in May 2016, where it was also announced that Home would run Google Assistant (a conversational evolution of Google Now intended to be integrated in other products announced at the conference as well). In October 2016, the iOS and Android mobile app used to initially set up Google Home and Google's other streaming devices was renamed from "Google Cast" to "Google Home", leaving Google Cast as the name solely of the protocol that "sends" audio/video content to play back on another device. The Google Home smart speaker was released in the US on November 4, 2016, and in the UK on April 6, 2017. In May 2017, Google announced that Home would be heading to Australia, Canada, France, Germany, and Japan in middle 2017, and the device subsequently became available for pre-order in Canada on June 2, 2017, with a retail date of June 26. In July 2017, Google announced the release of Google Home in Australia on July 20, 2017, France on August 3, 2017, Germany on August 8, 2017, and Italy on March 27, 2018. The Google Home and Home Mini were released in India on April 10, 2018. Various forms of both in-house and third-party services are integrated into Google Home, allowing users to speak voice commands to control interaction with them. Examples of supported services include Google Play Music, Spotify and iHeartRadio for audio, Netflix, YouTube and Google Photos for videos and photos, Google Calendar and Google Keep for tasks, and CNN, CNBC, BBC and The Wall Street Journal for news updates. New services are integrated on an ongoing basis. Google Assistant, an intelligent personal assistant, is included as the main and only assistant in Google Home. Unlike its predecessor, Google Now, Assistant is able to engage in two-way conversations with users. The Wall Street Journal reported in October 2016 that Google hired writers from Pixar movies and The Onion satirical newspaper to develop a personality for the Assistant, with a long-term goal being to invoke a sense of emotional rapport in users. Users can connect and group together multiple Home speakers for synchronized playback of music in every room. A notable feature omission, multiple accounts, was criticized by JR Raphael of Computerworld in November 2016, but an update for users in the United States in April 2017 enabled the feature. Google Home can now recognize up to six different voices, pulling information from their different accounts depending on who's talking. Google Home has integration with each user's calendar, for adding reminders or appointments verbally. Google Home includes home automation features, enabling owners to use it as a central hub to control smart devices. Examples of supported devices include the Chromecast digital media player, and products from Nest, SmartThings, Philips Hue, LIFX, LightwaveRF, and Logitech Harmony. In May 2017, Google announced multiple updates to Google Home's functionality. It now supports hands-free calling, letting users make calls to any landline or mobile phone in the United States and Canada for free. Google Voice users can set Google Home with voice number to make personal and business calls. There is no 9-1-1 emergency services support, however. "Proactive Assistance" enables the device to dictate updates to users without being asked, including updates on traffic before a scheduled event. "Visual Responses" let users send answers from Google Home onto their mobile device or Chromecast-enabled television. The device now also supports Bluetooth audio streaming through compatible devices (including phones, tablets and computers), and the ability to schedule calendar appointments, with upcoming support for reminders. On March 28, 2018, Google made the announcement via their blog that users would be able to pair any of their Google Home devices to their own Bluetooth speakers without requiring the use of a Chromecast streamer. On November 5, 2018, Google announced their partnership with Disney to bring interactive read-along books to Google Home. The Information reported that Google Home's internal hardware was very similar to that of Chromecast, with the same ARM processor and Wi-Fi chip. A teardown of the original model by iFixit in November 2016 confirmed that the device featured many of the same hardware components as the second-generation Chromecast. The original Google Home model is a cylindrical speaker that is 5.62 inches (143 millimetres) high, and 3.79 inches (96 millimetres) in diameter. The top surface of the device features colored status LEDs, and features capacitive touch controls to start and stop music, and adjust volume. A mute button is located on the back of the device, which disables the microphones. The base of the device is covered by a shell acting as a speaker grille, which is designed to be removed and replaced with one that suits the decor of a room. As of November 2016[update], Google offers fabric shells in "Mango", "Marine", and "Violet" color finishes, and metallic shells in "Carbon", "Copper", and "Snow" finishes. A Coral-colored Home Mini, listening. Google unveiled Google Home Mini during a hardware-focused event on October 4, 2017, which was released on October 19, 2017. It is a variant of Google Home with the same overall functionality, but in a smaller pebble-like form factor around 4 inches (10 cm) in diameter, with a fabric top that its white-colored status lights shine through. It has a mute switch rather than a mute button, and uses a micro USB connection for power. It is available in "Chalk", "Charcoal", "Coral", or "Aqua" color options. Analysts compared the Google Home Mini to Amazon's equivalent Echo Dot model. Google also unveiled Google Home Max during its October 4, 2017 event and was released on December 11, 2017. It is a larger version of the device with stereo speakers (including two tweeters and subwoofers), an audio connector, and a USB Type-C connector intended for a wired ethernet adapter. Home Max will be sold in "Chalk" and "Charcoal" colors, and include a magnetically-attached stand for vertical orientation. Home Max also includes "Smart Sound", an adaptive audio system that uses machine learning to automatically adjust sound output based on factors such as the environment (including placement and sources of noise) and time of day. Analysts considered Home Max to be a more direct competitor to other speaker products such as those of Sonos, as well as Apple's HomePod. On October 9, 2018, Google unveiled Google Home Hub, which features a 7-inch touchscreen display that can be used to provide visual feedback for queries. The "Home View" feature provides a centralized, visual interface for controlling supported home automation devices. Unlike its closest competitor, the Amazon Echo Show, the Home Hub does not include a camera for video calls, citing customer privacy concerns. Although Google has developed an OEM solution for Assistant-powered smart display devices based on Android Things and a Qualcomm system-on-chip, the Home Hub utilizes a different hardware platform. The device is available in light grey, dark grey, pink, and aqua blue. The Product Design lead for the Home Hub was James Nelson Castro and System Engineering Lead was Willy Cheung. A security issue has been reported[clarification needed] on which has been dismissed as a non issue by Google as the attack would require access to the same WiFi network as the device. The original Google Home received favorable reviews, although many reviews critiqued it in comparison to the competing Amazon Echo. The Google Home's design and sound input/output received significant praise, while a lack of interoperability between other Google Assistant-enabled devices was criticized. Critics voiced concerns about Google's intentions with the device, particularly whether features would be more tightly integrated into other Google products and one critic noted that Google Home's functionality was more limited than those offered through the Google Assistant on other platforms. Reviewers had very different experiences with the setup process, with one critic praising it while another criticized it, and Google Home's search-based answers was the subject of debate, with one reviewer praising its capabilities while another highlighted multiple bad-quality answers. David Pierce of Wired compared Google Home to Amazon Echo, writing in a summary that "Sometimes Home feels like sci-fi magic. Sometimes it reaches beyond its grasp and falls flat. The Echo is less impressive, but more reliable". Pierce praised the look of Google Home, writing that it feels "minimalist, thoughtful, and warm" in the environment, and also praised its speaker, describing it as "richer, brighter and more dynamic than the Echo, and loud enough to fill a room". While noting that Home's use of the Google Assistant functioned in different ways than it does through the Allo app or Pixel smartphone, meaning quick instructions rather than longer tasks, he praised its search abilities, writing that "you’d expect Home to excel at search. It does", despite some wrong search hiccups. Pierce criticized its lack of interoperability with other Google Assistant-enabled devices, though he called its future potential for connecting information across Google's product lines "enormous". Ron Amadeo of Ars Technica praised Google Home's setup process and its ability to pick up voice commands even from a distance, calling the latter "absolutely incredible". He noted the device's limiting of its Bluetooth capabilities at the time (before the May 2017 update), however, writing that "it's important to know that Google Home is not a Bluetooth speaker; it's purely a Google Cast device. If you want to play audio on a Google Home, the service needs to have a Google Cast button". He similarly criticized the Assistant's lack of cross-device functionality, writing that "Pretty much all the actions you send to a Google Home will stay on that Google Home, and there's never an interaction with your phone", and he noted concerns and questions regarding whether Google has an intention to incorporate the functionality deeper into its product lines. Additionally, in his summary, he wrote that "Why pay $129 for a device that is less capable than an Android phone?". 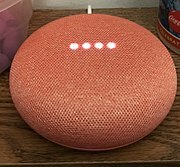 Prior to its release, a major bug was discovered on some Google Home Mini devices, where "phantom input" on its touch-sensitive surface—which could be tapped to activate Assistant without using a hotword command—caused Assistant to inadvertently activate on its own, resulting in unwanted voice recording. Google disabled, and then permanently removed, the ability to activate Assistant by touch on Home Mini models due to privacy issues associated with the bug. In December 2017, Google released an update to Home Mini, letting users long-press the volume buttons to play and pause audio. ^ Havard, Scott (November 7, 2016). "Google Home Teardown". iFixit. Retrieved December 6, 2017. ^ a b c d e f g "Google Home specifications". Google Home Help. Google. Retrieved December 6, 2017. ^ Dye, John (March 24, 2016). "Google is brewing a competitor to Amazon Echo". Android Authority. Retrieved March 28, 2017. ^ a b Bohn, Dieter (May 18, 2016). "Google Home: a speaker to finally take on the Amazon Echo". The Verge. Vox Media. Retrieved March 28, 2017. ^ Grunin, Lori (May 18, 2016). "Android N, Daydream VR, Google Home and more: Everything announced at Google I/O 2016". CNET. CBS Interactive. Retrieved March 28, 2017. ^ Mossberg, Walt (May 19, 2016). "Mossberg: Google doubles down on AI". The Verge. Vox Media. Retrieved March 28, 2017. ^ Pendlebury, Ty (October 26, 2016). "Google Cast is recast as Google Home companion app". CNET. CBS Interactive. Retrieved April 11, 2017. ^ Lardinois, Frederic (October 4, 2016). "Google Home will go on sale today for $129, shipping November 4". TechCrunch. AOL. Retrieved April 13, 2017. ^ Bohn, Dieter (October 4, 2016). "Google Home is smart, loud, and kind of cute". The Verge. Vox Media. Retrieved April 13, 2017. ^ Hautala, Laura (October 5, 2016). "Google Home to sell for $129, launches on November 4". CNET. CBS Interactive. Retrieved April 13, 2017. ^ Warren, Tom (March 28, 2017). "Google Home launches in the UK on April 6th priced at £129". The Verge. Vox Media. Retrieved March 28, 2017. ^ Burgess, Matt (March 28, 2017). "Google Home is coming to the UK on April 6 for £129". Wired. Condé Nast. Retrieved March 28, 2017. ^ Palmer, Jordan (May 17, 2017). "Google Home launching in Canada, Australia, France, Germany, and Japan this summer". Android Police. Retrieved May 17, 2017. ^ Thorp-Lancaster, Dan (May 17, 2017). "Google Home is headed to 6 new countries this summer". Android Central. Retrieved May 17, 2017. ^ Etherington, Darrell (June 2, 2017). "Google Home now available for pre-order in Canada". TechCrunch. AOL. Retrieved June 4, 2017. ^ Moon, Mariella (June 2, 2017). "Google Home will arrive in Canada on June 26th". Engadget. AOL. Retrieved June 4, 2017. ^ Whitwam, Ryan (July 6, 2017). "Google Home is coming to France, and it (predictably) speaks French now". Android Police. Retrieved July 18, 2017. ^ Davenport, Corbin (August 8, 2017). "Google Home arrives in Germany for €149". Android Police. Illogical Robot. Retrieved December 6, 2017. ^ "Mettetevi comodi: Google Home e Google Home Mini arrivano in Italia". Google Blog Italia. March 22, 2018. Retrieved March 22, 2018. ^ a b Statt, Nick (October 4, 2017). "$49 Google Home Mini announced to compete with Amazon's Echo Dot". The Verge. The Verge. Retrieved December 6, 2017. ^ a b c Singleton, Micah (October 4, 2017). "Google Home Max is a supersized version of the smart home speaker". The Verge. Vox Media. Retrieved December 6, 2017. ^ Kharpal, Arjun (April 10, 2018). "Google Home smart speaker launches in India, joining Amazon Echo". CNBC. Retrieved April 10, 2018. ^ Westenberg, Jimmy. "The complete list of services with Google Home support (Updated)". Android Authority. Retrieved April 13, 2017. ^ Callaham, John (December 15, 2016). "Google adds more than 30 new services to Google Home". Android Authority. Retrieved April 13, 2017. ^ "Talk to your Google Assistant on Google Home". Google Home Help. Google. Retrieved April 13, 2017. ^ Lynley, Matthew (May 18, 2016). "Google unveils Google Assistant, a virtual assistant that's a big upgrade to Google Now". TechCrunch. AOL. Retrieved April 13, 2017. ^ Mims, Christopher (October 9, 2016). "Your Next Friend Could Be a Robot". The Wall Street Journal. Dow Jones & Company. Retrieved April 13, 2017. ^ Hartmans, Avery (October 10, 2016). "Google hired writers from Pixar and The Onion to make Assistant more personable". Business Insider. Axel Springer SE. Retrieved April 13, 2017. ^ Dye, John (October 10, 2016). "How The Onion and Pixar helped build Google Assistant". Android Authority. Retrieved April 13, 2017. ^ "Design that speaks for itself". Google Home. Google. Retrieved April 13, 2017. ^ Raphael, JR (November 1, 2016). "Google Home has a glaring flaw". Computerworld. International Data Group. Retrieved April 13, 2017. ^ Welch, Chris (April 20, 2017). "Google Home now supports multiple users, but still can't separate work and personal accounts". The Verge. Vox Media. Retrieved April 21, 2017. ^ Lardinois, Frederic (April 20, 2017). "Google Home can now recognize up to six voices and give personalized responses". TechCrunch. AOL. Retrieved April 21, 2017. ^ Amadeo, Ron (April 20, 2017). "Google Home can now tell users apart just by their voice". Ars Technica. Condé Nast. Retrieved April 21, 2017. ^ "LightwaveRF hitches ride on internet of things boom". Financial Times. Retrieved June 17, 2017. ^ Lagace, Marc (March 30, 2017). "These products and services work with Google Home". Android Central. Retrieved April 13, 2017. ^ Quinn, Paul (May 17, 2017). "Google Home to add hands-free calling, personalizes the experience". Android Police. Retrieved May 17, 2017. ^ Kods, Sam. "How to Set Google Home to Call with Google Voice Number". ^ Welch, Chris (August 16, 2017). "How to make phone calls with Google Home". The Verge. Vox Media. Retrieved December 6, 2017. ^ a b Hardawar, Devindra (May 17, 2017). "Google Home is getting proactive assistance and visual responses". Engadget. AOL. Retrieved May 17, 2017. ^ Kastrenakes, Jacob (May 17, 2017). "Google Home will soon notify you about reminders, flight updates, and more". The Verge. Vox Media. Retrieved May 17, 2017. ^ Garun, Natt (May 17, 2017). "Google Home can soon cast its response to your TV". The Verge. Vox Media. Retrieved May 17, 2017. ^ a b Matney, Lucas (May 17, 2017). "Google brings hands-free calling, proactive alerts to Home". TechCrunch. AOL. Retrieved May 17, 2017. ^ Scrivens, Scott (May 17, 2017). "Bluetooth streaming added to Google Home, now you can play anything". Android Police. Retrieved May 17, 2017. ^ Steele, Billy (May 17, 2017). "Google Home gains Bluetooth connectivity to play audio from any device". Engadget. AOL. Retrieved May 17, 2017. ^ Palmer, Jordan (May 17, 2017). "Google Home will now let you schedule calendar appointments, reminders coming soon". Android Police. Retrieved May 17, 2017. ^ "Google Home and Bluetooth speakers make the perfect pair". Google. March 28, 2018. Retrieved March 28, 2018. ^ "Google Home Partners with Disney for Read-along Books". Security Baron. November 5, 2018. Retrieved November 13, 2018. ^ "iFixit teardown confirms Google Home is basically an overgrown Chromecast". The Verge. Retrieved October 5, 2017. ^ "Google Home specifications". Google Home Help. Google. Retrieved April 13, 2017. ^ Gebhart, Andrew (October 4, 2016). "Alexa who? Google Home wants to kick Echo off of your countertop (hands-on)". CNET. CBS Interactive. Retrieved April 13, 2017. ^ Cipriani, Jason (December 25, 2016). "Google Home: 11 tips and tricks to get started". CNET. CBS Interactive. Retrieved April 13, 2017. ^ McGrath, Jenny (March 10, 2017). "Is there an Echo in here? How Google Home compares to Amazon's Bluetooth speaker". Digital Trends. Retrieved April 13, 2017. ^ Callaham, John (November 7, 2016). "More Google Home base colors now available starting at $20". Android Authority. Retrieved April 13, 2017. ^ Martin, Taylor (January 10, 2017). "How to customize the appearance of Google Home". CNET. CBS Interactive. Retrieved April 13, 2017. ^ Pierce, David (October 4, 2017). "Google Home Mini puts Assistant anywhere and everywhere". Wired. Condé Nast. Retrieved December 6, 2017. ^ a b c Bohn, Dieter (October 4, 2017). "First look at Google Home Mini and Max". The Verge. Vox Media. Retrieved December 6, 2017. ^ "Google Home Max is now on sale, here's where you can buy it". Android Central. December 11, 2017. Retrieved December 27, 2017. ^ Chacos, Brad (October 4, 2017). "The Google Home Max takes aim at Sonos speakers with big sound and dynamic AI smarts". TechHive. International Data Group. Retrieved December 6, 2017. ^ Goode, Lauren (October 9, 2018). "Google Wants Its New Home Hub to Live in Every Room of Your House". Wired. Retrieved October 10, 2018. ^ Moore, Clayton (October 9, 2018). "The Google Home Hub smart display and speaker lacks a camera by design". Digital Trends. Retrieved October 10, 2018. ^ "The Google Home Hub will put Assistant up against Amazon's Echo Show". The Verge. Retrieved October 11, 2018. ^ "Google Home Hub—Under the hood, it's nothing like other Google smart displays". Ars Technica. Retrieved October 11, 2018. ^ Ingraham, Nathan (October 9, 2018). "Google Home Hub hands-on: A surprisingly compact smart display". Engadget. Oath Inc. Retrieved October 10, 2018. ^ Pierce, David (November 3, 2016). "Review: Google Home". Wired. Condé Nast. Retrieved April 26, 2017. ^ Amadeo, Ron (November 3, 2016). "Google Home review: A step forward for hotwords, a step backward in capability". Ars Technica. Condé Nast. Retrieved April 26, 2017. ^ Russakovskii, Artem (October 10, 2017). "Google is permanently nerfing all Home Minis because mine spied on everything I said 24/7 [Update x2]". Android Police. Illogical Robot. Retrieved December 6, 2017. ^ Amadeo, Ron (October 12, 2017). "Pre-release Google Home Mini goes rogue, starts recording 24/7 [Updated]". Ars Technica. Condé Nast. Retrieved December 6, 2017. ^ "Google disables touch function on Home Mini". BBC News. BBC. October 12, 2017. Retrieved December 6, 2017. ^ Kastrenakes, Jacob (December 8, 2017). "Google brings play and pause buttons back to the Home Mini". The Verge. Vox Media. Retrieved December 9, 2017. ^ Gebhart, Andrew (December 8, 2017). "Google Home Mini resurrects touch play controls". CNET. CBS Interactive. Retrieved December 9, 2017.